This week the first zucchinis were picked. All baby size but just perfect in freshness and flavour. One of our favourite ways to serve is sliced longways in half and fried in Extra Virgin Olive Oil drizzled with some soy sauce and served warm either as a nibble with wine or as a side dish with the main course. Yesterday the first two Lebanese Cucumbers were picked. Only small, no more than 150 mm in length so that the seeds are immature. Cut off the bitter top and tail then slice lengthwise and served with a little sprinkling of coarse salt. The slight coolness of the interior contrasting with the sun warmth of the skin. A pleasant surprise to find two ripe Beefsteak Tomatoes. Also found two Hungarian Wax Capsicums ready to go. Must be a good season as this is the earliest harvest of these two we have ever had. 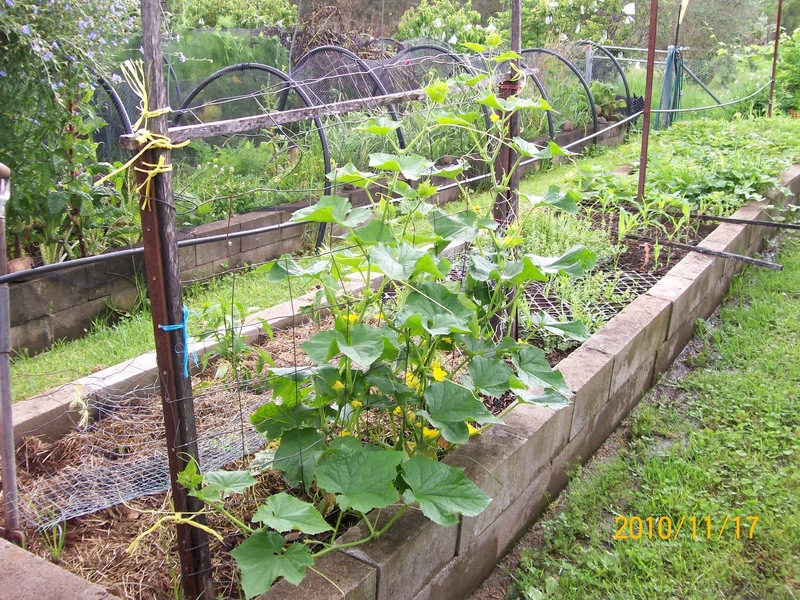 The rattlesnake beans are flowering more heavily and multiple tendrils have climbed the baling twine with some already tangling at the top. One day it would be interesting to see just how high they might grow. On the other hand that might awaken giant up there. 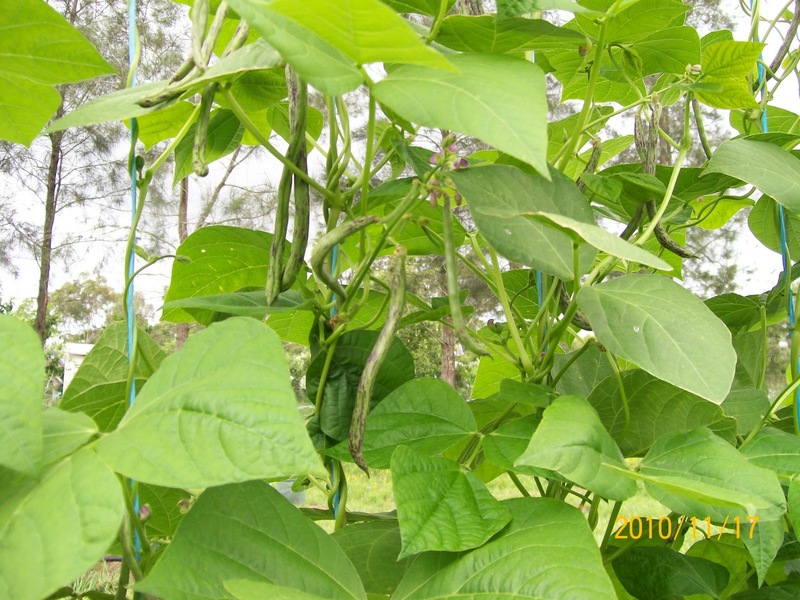 The early flowers are already beans 75 mm in length. 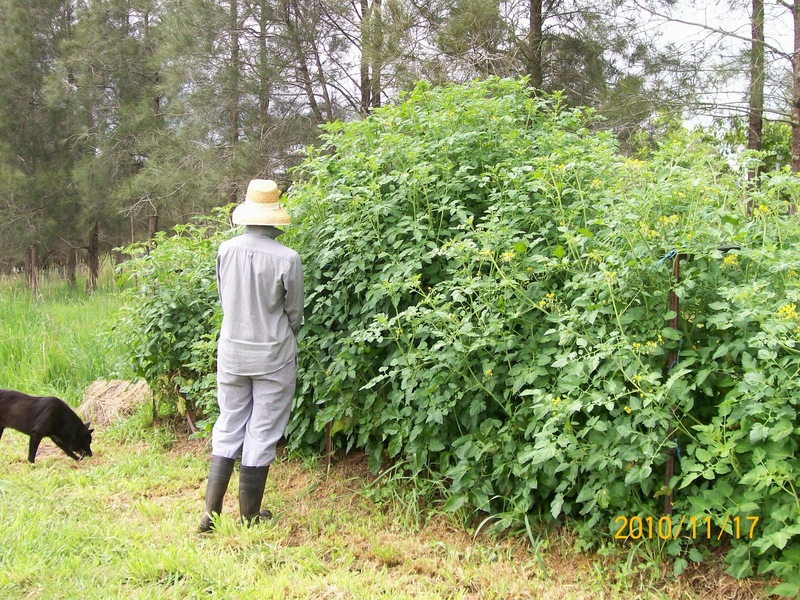 Another few days and we should be eating our first crop. Again we favour a simple recipe. Top and tail steam lightly until they change colour slightly then drizzle with Walnut oil and again a light sprinkle of salt. Serve as an entrée or with the main course. Bees are so important for successful pollination. 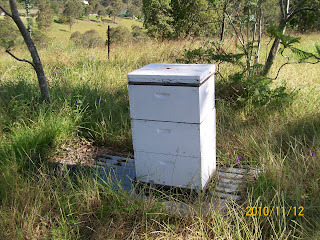 With so many fruit trees and vegetables growing we find it critical to have our own hives. The free honey that comes with the hive is a bonus that more than justifies the small amount of work to maintain them. Our hive numbers fluctuate. We try to catch any swarms that form, sometimes these are not viable. As with so many other projects we can’t claim any great expertise but we try our best. Sometimes we lose a hive because of our poor management and this encourages us to take more care. Reading the bee books and experience improve our performance ,however we yearn to spend time with an experienced apiarist to get a better grounding. When we first began this low income lifestyle it was imperative to understand how much we were spending and on what, as well as to be able to mould our monthly outgoings to our varying monthly incomings. There was also a goal to put some money aside each month to service the remaining mortgage and when it evaporated that surplus was needed to build a reasonable buffer against lean times. Initially we set the buffer at a minimum of six months then as opportunities arose grew it to 2 years. That means if we were unemployed for two years, we would not be destitute. The critical tool for achieving this was the budget. The initial setting up requires a little effort. There are free software tools available on the web but we chose to use Microsoft Excel. The time consuming work revolves around gathering the historical data of the past 12 month’s expenditure. In our case, we had a shoe box with the past years shopping dockets and invoices from the various utilities etc. Once sorted, the task wasn’t too bad. Starting with expenses sets the scene because it dictates how much you must earn. The breakup of categories depends on what needs to be tracked. Telephone, fuel and electricity are three classifications it pays to keep separate at first as they can be reduced. After twelve months of targeting fuel, telephone and electricity reductions personal behaviours change permanently. At first it is a good idea to have a lot of categories to track in order to build a bit of history. Personal items mostly involve discretionary spending and we tracked these by individual. Shopping was broken into a number of categories such as food, wine, pet food, seeds and seedlings, fish, meat, cheese making supplies etc. The motor vehicle costs are split between fuel, services (including tyres & batteries) and registration and insurances. The budget then consisted of four columns for every month ie Planned Expenditure for the month, Last Year’s expenditure for this month, Actual expenditure for this month and the variance between the Plan and Actual. There was a subtotal of expenditure for the month at the bottom, followed by the income items for the month by individual and a subtotal for income. Income and expenditure were subtracted to see if there was a profit or loss for that period, this could then be either put aside as savings or put towards the mortgage. Every month, once the numbers were complete, we would look at the variances over a cup of tea and discuss progress. Sometimes the savings were false as the expenditure had been deferred to the following month. In these cases we adjusted the plan accordingly. If there were true savings or overspends, we assessed why and discussed future actions. One benefit of laying out the whole year’s expenditure by month is that one off big bills such as Home Insurance are visible ahead of time and can be accommodated accordingly. Although we use a Credit Card to pay for shopping and other outgoings we never ever not pay off the full amount each month. Better to have a few lean months and go without some things than needlessly incur interest payments. A surprising thing happens when the mortgage is paid off. Suddenly there is this quite a large amount of money which doesn’t need to be spent. Depending on the size of your mortgage and repayments, this can be a significant sum. At this point the sensible thing to do is forget you have the surplus. Don’t be silly and try to justify its spending as some form of reward. Put it straight into a special savings account with the best interest you can get and build up your security buffer. When we want something special such as a new large screen TV then we set up a savings program to get it. This serves three purposes. Firstly, there is a separation of time between your desire and the actual event. This is an ideal situation to ensure that your interest in the acquisition is not a passing fad. Secondly, by saving separately you confirm that you have the long term funds to contribute to the new object. Thirdly, waiting for something increases the pleasure. Not only satisfaction of reaching the savings level needed, but then the purchase and use afterward. One important shopping tool that we always use is discussion. Anything that is not a standard shopping item on a list is not purchased without prior discussion. And that means anything irrespective of the value. An item of clothing, a new tool, a book all are bounced off the other partner. This discussion starts with do we really need it and progresses through is there are better way of getting it to is it the best model ie should we pay extra and get a higher quality more expensive item with a greater duty cycle. We don’t set a minimum dollar limit to discussion items. Every dollar adds up. Speaking of dollars all loose change is confiscated in this household. The eye opener is how often this results in another $100 going into savings or off a mortgage. Two other planning tools are useful. The first is the Capital Replacement Program. This is a list of all our major appliances such as washing machine, dishwasher, freezers etc. Against each are its age and an estimate of when it may need to be replaced either because of age or inefficiency and a generous estimate of cost. When planning each year’s budget a quick reference to the Capital Replacement Program allows the insertion of any potentially large expenditure. The second tool is the Repairs and Maintenance Plan. This lists all the big jobs. Painting the house outside, painting certain rooms, fencing replacement, additional paving etc. Again against each item the associated costs and when it should be scheduled. And again this is referenced when planning the new year’s budget. There is surprisingly little effort required in maintaining these plans and budgets once established. Gradually from year to year the categories change as the process is streamlined and we feel the situation is under control. Being so high up in the valley we don’t have ready views of bubbling creeks, dams or rivers. 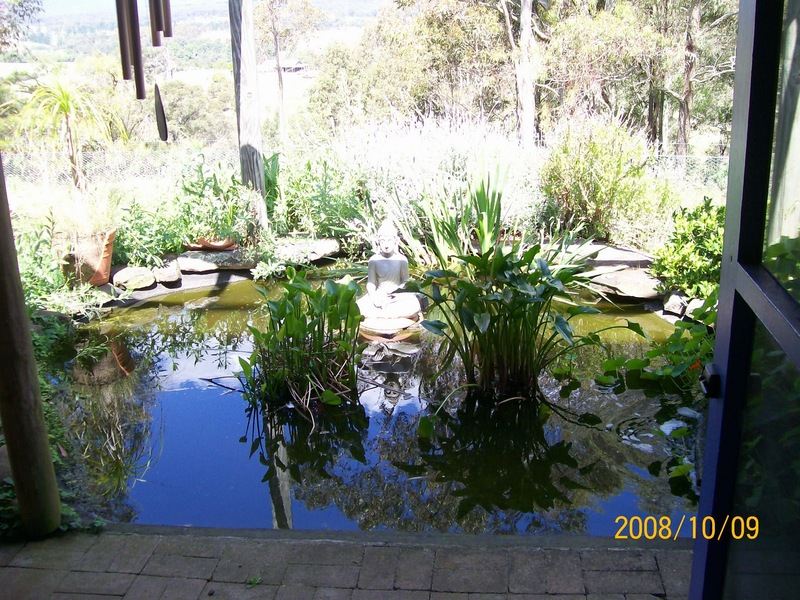 Our solution was installing a pond as our water feature with resident gold fish and water lilies. There is a flow form waterfall which we activate from time to time. We don’t have the pump operating all the time as we found there was a correlation between the flowing water and the reproduction processes of the resident gold fish. The original 7 gold and one black have grown considerably over the years. We now practise sensible birth control by switching on the pump less frequently. The design of the pond has meant a draining and resurfacing every few years was necessary. Some of this may be a result of the odd dog cooling off on a hot day which may have breached the membrane. A small design fault also causes cracks. The pond is cemented too closely to the pergola uprights which flex from time causing the concrete to fracture. Either way the occasional refurbishment is minor to the pleasant vista and gurgling sound of running water nearby. In the evenings there is beautifully serene scene across the pond and its foliage with a backdrop of the valley beyond.